Startseite » Newsroom » Blog » Why Go Digital? All the metrics you use to measure success indicate that you are doing just fine – So why “Go Digital”? 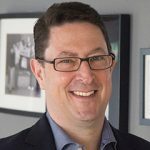 etventure’s CEO for North America, Lukas Bower, provides some context – and clarifies why business leaders should not only “Go Digital”, but make innovation a top priority. Years ago, I worked in the TV and film industry. Content was king, margins were high, and the notion that nascent internet content delivery would ever pose a threat seemed ridiculous. So, the industry simply carried on with business as usual – putting innovation on the back burner. I think we all know how that story worked out. What is the essence of disruption? With Netflix, this meant the on-demand availability of content, on any device. Once the Netflix platform became the preferred mode of delivery, Netflix took the next step and entered the content business themselves – and they are only getting started. With disruption, the disruptor offers such a superior value proposition that your customers will leave you in droves – and are unlikely to ever come back. This is true even if you can replicate the capability of the disruptor. Unfortunately, once disruption occurs, you’ve missed the boat on innovation. As the saying goes, “timing is everything”. 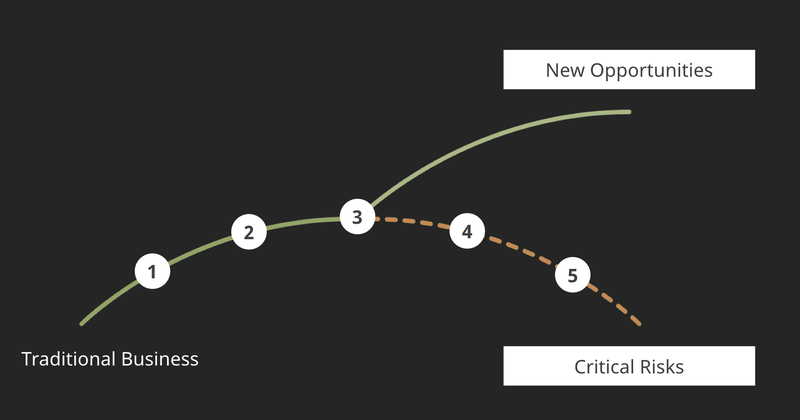 This is true of innovation – the timing versus risk to pursue innovation sits on a curve – see Figure 1. Traditional businesses operating in a purely traditional marketplace are at the low-risk end of the curve. However, we no longer operate in a traditional marketplace. Instead, radical innovation is occurring across all industries – even within “old economy” sectors such as manufacturing. So, traditional businesses operating in our innovative marketplace have reached a critical infection point. This inflection point is a crossroads – the point where your business either seizes the opportunity to innovate, or doesn’t. The problem with missing this window? If you “wait and see”, the challenges of moving too late become insurmountable. The required time, costs, risks all become unsustainable – factoring in diminished the returns that can be achieved in the face of disruptive competition. The net result? Game over for your business. However, the future is not as bleak as it may seem. In the last decade, the art of innovation has become a science. Rather than relying on “gut instinct”, the mechanisms behind successful innovation are now understood – and can be repeated successfully. Traditional industries are able to leverage this expertise to drive innovation. 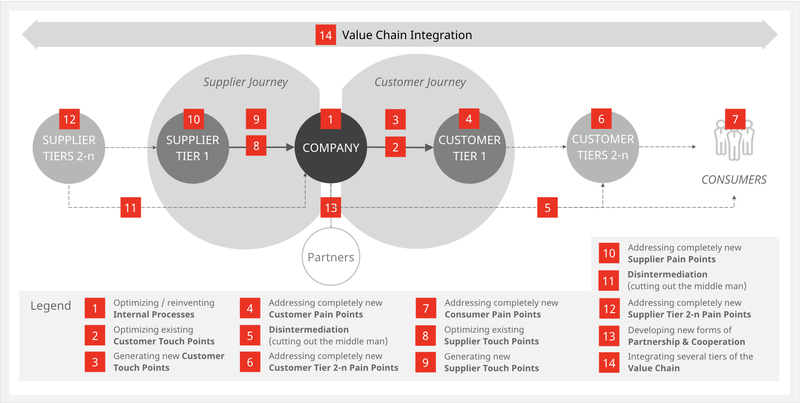 Fundamentally, innovation begins with an exploration of “pain points” along your entire value chain. 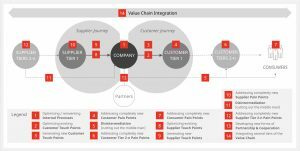 Pain points, as the name implies, are factors which frustrate your customers, suppliers and/or staff. Each pain point represents a potential opportunity for top line growth or bottom line savings – see Figure 2. To learn more about the specifics of creating and executing an innovation strategy, read “A Fresh Take on Digital Strategy” and “A Beginner’s Guide to MVPs”. Virtually every industry is at or near the critical inflection point on the “Pursuit of Innovation” Curve. It is time to take action, so where to start? The first step is to clarify the key objectives for your business. These should strike a balance – pushing your business outside its comfort zone, but still remaining within your capabilities. The next step – get started. Whether you take a DIY approach and start in-house, or go outside your business and engage a partner, don’t wait – get moving! We’ve been involved a large number of innovation engagements at etventure, and we’ve identified CxO involvement as the critical factor for success. This does not necessarily mean getting down into the detail, but it does mean keeping a guiding hand on your innovation project – from start to finish. If you’ve read out Beginner’s guide to MVPs, you’ll know that part of the innovation process involves testing, validating and changing direction. This goes against most of our “do it once/do it right” instincts, but it is critical that the C-suite drives this rapid cycle of experimentation, and potential failure – as this is where the true magic happens. We are in the midst of an entirely new industrial revolution – some call it “Industry 4.0”. This revolution will see a dramatic shakeup of the status quo – with new leaders emerging, and competitors crossing boundaries between industry verticals to disrupt adjacent markets. It is both an exciting and terrifying time to be a business leader. You cannot remain complacent, and assume your sector is not at risk – virtually every industry has reached the critical inflection point on the “Pursuit of Innovation” Curve. Take action and get started – you may be surprised at the new opportunities you find for your business. If the challenge seems too daunting, contact us. We can not only help get you started, but we can empower build your own innovation capability within your business. Lukas Bower has a senior leadership background across technology, media and consulting – and has experienced an industry disruption firsthand. Lukas and his team leverage their expertise to help other executives drive successful Digital Transformation.